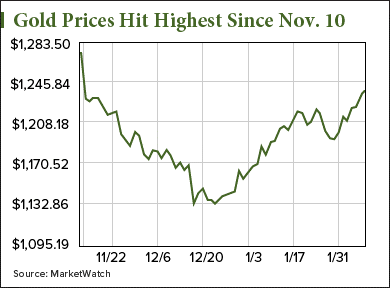 The big gold investing news today (Wednesday, Feb. 8) is the price of gold hitting its highest level in nearly three months. As of 8:35 a.m., the gold price today is up 0.5% and trades at $1,242 per ounce. At this rate, prices are on track for the highest settlement for an active gold futures contract since Nov. 10, 2016. That was when gold prices closed at $1,272.80. With today's gain, the price of gold is up 7.6% in 2017. That means anyone who bought the front-end April gold futures contract at its close of $1,154.30 on the last trading day of 2016 has earned $87.70 per ounce since then. Must See: A door has opened for an ultra-rare but powerful anomaly in the stock market… It involves a precious metal, one that's considered exceedingly more rare than gold. Get all the details. And we see gold prices scoring even bigger gains in the months ahead. According to Money Morning Resource Specialist Peter Krauth, the gold price will rally through the end of 2017 thanks to one of the most important bullish trends in the gold market right now. Since early January, a growing trend in the gold sector has been huge inflows of cash into gold mining exchange-traded funds (ETFs). In January, the world's top 10 gold and silver ETFs attracted roughly $1.6 billion in investment. Even more impressive is that long-only ETFs – which represent bullishness on long-term gold prices – attracted $200 million last month. Bloomberg reported that January was the first monthly inflow for long-only ETFs since October 2016. For example, the Frankfurt Stock Exchange-listed Xetra-Gold ETF drew in $793 million last month. That was more than any other ETF across the entire commodities sector. Meanwhile, the $12.2 billion Market Vectors Gold Miners ETF (NYSE Arca: GDX) saw an inflow of $165 million. Traders and investors pouring hundreds of millions into gold ETFs shows they believe gold's value will surge over the long term. That ultimately translates into bullish sentiment, which attracts more investors to buying gold and gold stocks. Rising inflows into gold ETFs ties into another gold investing news story that deals with an emerging trend among gold traders. The trend has to do with a type of position in the gold market whose overall volume has seen a marked decline since November 2016. Do you suspect that all the washed up celebrities that are constantly trying to sell me gold have any bearing on this upward trend…creating a stir in masses of people to push prices higher and keep driving the price up simply due to the constant hype?? What sort of consumption/utilization numbers exist to warrant the higher prices or does it even matter about actual consumption?